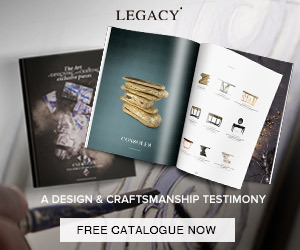 With a rich heritage of 40 years, Decorex is internationally renowned for being the destination where interior design professionals discover the finest and most coveted luxury products from new, emerging and established talent. Returning to Syon Park to open London Design Festival, take your seat among the industry’s elite. Today Modern Dining Tables blog will present you a selection of 10 exhibitors which are going to present their beautiful luxury products in the London festival and that you should not miss them. Here you will find some examples of their brilliant dining tables and dining room decorations. Get inspired and enjoy the festival. Indian Ocean, founded in 1990 with a philosophy to offer their clients the ultimate collection of luxury outdoor furniture. With a passion for innovation, they lead the way as the specialist design-led outdoor furniture company in the UK. Take a look at this amazing outdoor dining area. Don’t miss them this year at London Design Festival. Bespoke Furniture designed and made in England. Leporello specialises in the design and production of a superb range of furniture from Dining to Bedroom to Children in both classic and contemporary styles. Each piece is hand made to order from hardwoods and meticulously hand finished in a range of paint colours and treatments. Take a look at this beautiful dining room designed with Leporello furniture. Don’t miss them this year at London Design Festival. 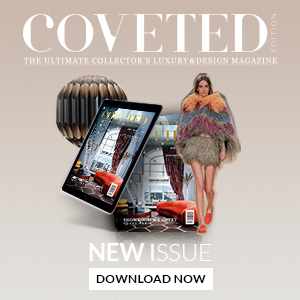 COVET LOUNGE is a project where 5 founding European design brands, Boca do Lobo, DelightFULL, BRABBU, KOKET and Maison Valentina have formed a group of designers & specialists that aim to fulfil the void in the design industry. This project consists of a place where designers, architects, press, bloggers and field experts come together for a design celebration. They will take you on a journey where innovation meets comfort and luxury. 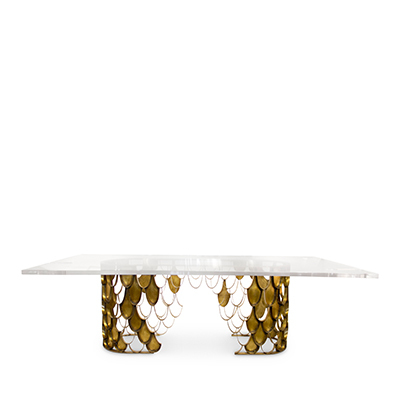 The image above is beautiful and creative modern dining table designed by the brand Boca do Lobo. Don’t miss them this year at London Design Festival. They are a company dedicated to producing unique wallpaper and fabric designs, each one hand drawn and colour matched meticulously. They use the best quality linens and velvets, which work for both upholstery and curtains. Perfect ideas for your dining room set. 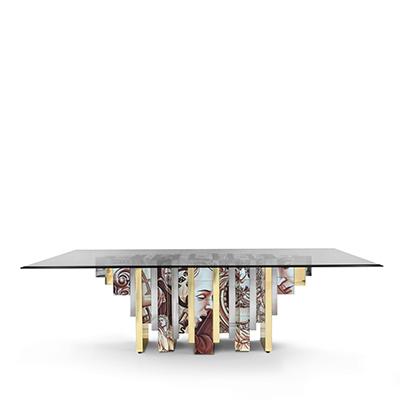 A Portuguese brand that designs amazing luxury and creative furniture. 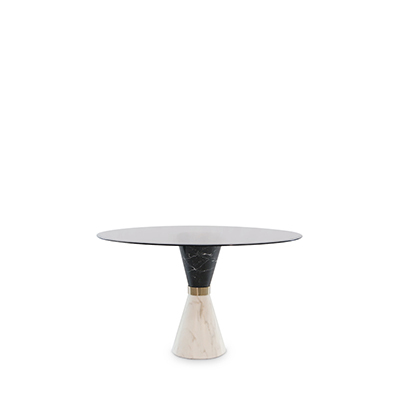 Take a look at this perfect dining table which you can have as a statement piece in your dining room. Don’t miss them this year at London Design Festival. Barn in the City collaborates intimately on projects ranging from residential and commercial, to hotels and yachts. The stand, which will be presented in a gallery style, will include a carefully selected range of the best-selling existing designs, a multi-textured, sunray-patterned decorative wood panelling, showcasing the versatility of repurposed wood, along with its newest creations. Bespoke specialist for architects and interior designers, Angelo Rugs offers a wide range of carpets (stairs, offices and hotels) and contemporary rugs. You can find in their stand beautiful rugs to use in your dining room area and impress your guests. Don’t miss them this year at London Design Festival. Fenella Elms studio specialise in creating flowing formations of porcelain for wall-mounting. You can decorate your dining table with these amazing decoration art pieces. Specialist of outdoor and indoor furniture, Ardamez provides hospitality professionals, designers and architects with its know how worldwide, offering high quality products custom made in France. Don’t miss them this year at London Design Festival. From the simplest design to the grandest fantasy, their luxury beds are heirlooms; hand made and hand finished by artisans who are devoted to their craft. There is a breathtaking variety of polished wood, veneers and bespoke paint finishes available, many of which can be upholstered in sumptuous fabrics.